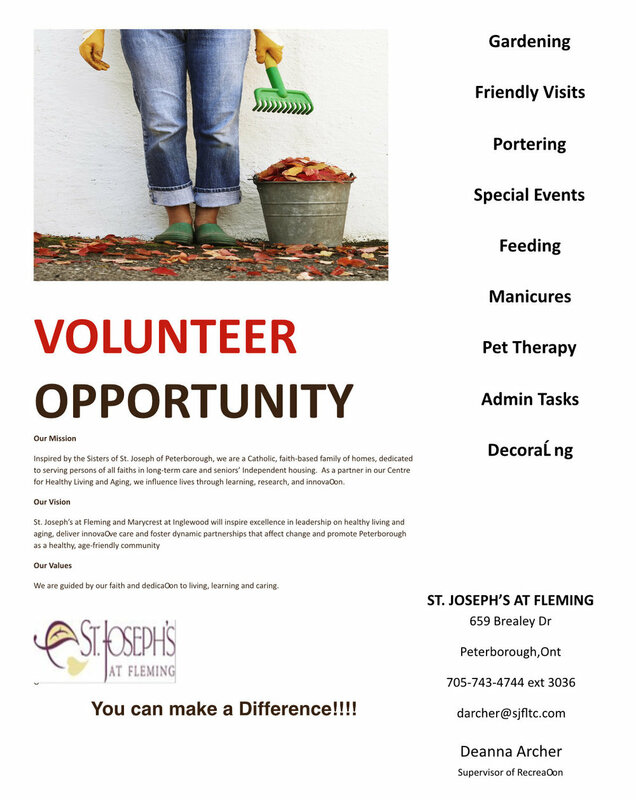 Peterborough has lots of great opportunities for volunteering. Below are current volunteer positions where you can lend a helping hand. If you would like to add an opportunity from your organization, drop us a note. 4th Line Theatre look for volunteers for each season at the Winslow Farm. "Help is also needed in front-of-house to greet and seat the audience and to help backstage with makeup and hair, costumes, set and prop painting, running crew and other production tasks." Find out more information through the 4th Line Theatre website. valuable in-home companionship for people with early stage dementia. Through the introduction of a volunteer companion for weekly visits, those affected by memory loss enjoy social interaction and activity with someone other than family. We have specific roles to fill in our Friendly Visiting program to support older adults living in Peterborough with dementia. Training and orientation is provided. A police check with vulnerable sector screen is required. Additionally, we are seeking helpers for our major fundraising campaigns including our Fire Truck Pull on September 18th, our Coffee Break campaign, and Face off Against Dementia an entertaining hockey event with the Peterborough Petes and Oshawa Generals. We are recruiting volunteers to participate on committees for these major events as well as to serve as volunteers on the day of for any of these events. There are always opportunities for motivated, committed individuals to help in our office. More information about volunteer opportunities can be found here. Contact Shawna Peddar, Volunteer/Friendly Visiting Coordinator, 1-800-561-2588. The Arthritis Society is currently seeking a few fun and fabulous people to help organize and implement Taste!, an evening of gastronomic indulgence, courtesy of some of the finest chefs, vintners and brewers of the region. Great opportunities await you in the areas of advertising and promotion, creative design, ticket sales, door prize and auction item procurement, registration, set-up and tear-down. The annual Walk to Fight Arthritis takes place on June 3rd and volunteers are needed now to help make this year’s Walk the best one ever! We have openings for committee members in the areas of community awareness and marketing, registration, volunteer coordination and management, site coordination, and entertainment, as well as day-of-event volunteers. The society is also looking for volunteers to train as facilitators for Chronic Pain Management Workshops. These 2-hour workshops focus specifically on pain management and are a great opportunity for those experiencing chronic pain to learn about themselves and the experiences of others. Instructor assistants for PA Day, March Break and Summer Art Camps. Perfect opportunity for high school students to achieve their mandatory community volunteer hours. The Aspire Mentorship program is a new partnership between the John Howard Society, Employment Planning & Counselling and Trent Valley Literacy Association. Our aim is to support youth (aged 17-25) in achieving their training and employment goals through a variety of interactions with a caring adult in our community. We are currently recruiting volunteer mentors from our community. This could be anything from coming to a drop in event and speaking about your job/field to leading a small group in a hands-on project or of course we also offer 1-1 mentoring over a longer period of time. We are soon offering Bridging Out of Poverty Teams — "Getting Ahead in a Just Gettin'-By World" program (for under-resourced folks) & the Mentors-to-allies training, both starting alongside one another at the beginning of February 2019. Bedford House is pleased to offer both of these programs for under-resourced folks and for future Mentors who are interested in volunteering with our Building Bridges Out of Poverty Teams Project. This is a weekly meeting opportunity for middle-class Mentors supporting our under-resourced Participants struggling with generational and situational poverty. For further information and any questions regarding these programs, please contact Katherin at 647-298-5331. Big Brothers and Big Sisters of Peterborough has several volunteer opportunities available. They are all mentoring opportunities, from the traditional Big Brothers/Big Sisters program to their school based programs. Contact Mark for more information. Overview: In your role, you will be helping the Canadian Cancer Society raise funds for cancer research and support for people living with cancer, family members and friends. Your strong leadership skills and organizational guidance will lead the committee to reaching not only the financial goal but also to strengthen the fight against cancer in your community. orking in partnership with your Canadian Cancer Society staff partner and the Relay For Life committee, you will provide leadership, support, and guidance in planning and executing this event. Your role involves working collaboratively with your staff partner to help shape the strategic direction of the Peterborough Relay For Life event which includes identifying opportunities for event growth and success. Qualifications: Experience in event planning an asset; strong leadership, organizational, and communication skills; comfortable making fundraising asks; dynamic speaker; and customer service focused. Overview: In your role, you will be helping the Canadian Cancer Society raise funds for cancer research and support for people living with cancer, family members and friends. Your strong leadership and networking skills will encourage teams and sponsors to fundraise and donate to help forward cancer research across Canada. As the Corporate Sponsorship and Team Recruitment Lead, you will utilize your personal and professional networks to assist in the promotion and team recruitment for Relay For Life by working collaboratively with your Canadian Cancer Society staff partner and the Relay For Life Event Chair. This role involves prospecting, developing and establishing new relationships and leads within the corporate community and sharing those leads with your Canadian Cancer Society staff partner. Qualifications: Community connector – willing to tap into personal and professional networks; experience in fundraising and friend-raising; able to establish new relationships easily; strong leadership, organizational, and communication skills; and able to motivate others. Term: 2-year term; monthly meetings from Jan – July; be on site for event day; approx. 10 – 15 hours per month. Overview: In your role, you will be helping the Canadian Cancer Society raise funds for cancer research and support for people living with cancer, family members and friends. Your strong community connections, proven leadership, and networking skills will encourage teams to fundraise to help forward cancer research across Canada. By utilizing your personal and professional networks you will assist in the promotion and team recruitment for Relay For Life by working collaboratively with your Canadian Cancer Society staff partner and the Relay For Life Event Experience Chair. This role involves prospecting, developing and establishing new relationships and leads within Peterborough and District, and sharing those leads with your staff partner as well as re-engaging past participants and teams. Qualifications: Community connector – willing to tap into personal and professional networks; experience in friend-raising; able to establish new relationships easily; strong leadership, organizational, and communication skills; comfortable representing the Cancer Society and promoting Relay For Life; and able to motivate others. Term: 2-year term; monthly meetings from Jan – July; be available for promotional events; be on site for event day; approx. 10 – 15 hours per month. For all of the above roles, interested applicants should contact Heather Johnson at heather.johnson@ontario.cancer.caor 1-800-668-7830 ex. 3249. Applicants should include a copy of their resume along with their email. The Canadian Cancer Society Relay for Life has numerous positions for volunteers to help run the event each year. This April, by volunteering just a couple hours of your time selling daffodil pins or fresh daffodils at local stores in support of the Canadian Cancer Society’s Daffodil Month campaign you can save lives and help people who are living with cancer now. Volunteers are needed on the following dates: April 9 through 11 and 16 through 18. The Canadian Cancer Society is looking for people who can spare two hours to help out during this critical fundraising time. Saturday April 11th is Student Day! Students needing community involvement hours can volunteer from 10-4! If you are interested in volunteering your time, please visit myccsschedule.ca or contact Alison Payne, Volunteer Engagement Coordinator at 705-742-3823. Saturday April 5th is STUDENT DAY!! This is a great opportunity for students to earn 6 Community Involvement hours with pizza lunch dropped to each location courtesy of Pizza Hut! Grab a friend and have fun raising money to support the Canadian Cancer Society! The Canadian Canoe Museum is looking for volunteers for their Admissions and Gift Shop. Read more about volunteering at the Museum. We need you! Canadian Blood Services is looking for volunteers to help in our clinic and community events in Peterborough. This is your opportunity to help save lives by donating your time. Purpose In-community volunteers support Canadian Blood Services initiatives, participate in local events, promote community awareness regarding Canadian Blood Services projects and assist with donor recruitment. How this role helps save lives By providing information about Canadian Blood Services and the opportunities to get involved, volunteers are able to raise awareness to community members, friends and networks on the impact by Canadian Blood Services can have on lives of Canadians through blood donation and other programs. The Canadian Diabetes Association Kawarthas Branch are looking for a variety of people for a variety of volunteer opportunities. There is a need for volunteers to do shifts in the office answering phones and keeping the office open. They also need volunteers with leadership skills and experience in fund development to lead fundraising projects and, they require team members for fund development activities. Contact them via e-mail if you are interested or by phone at 705-742-2733. Have a look at their Facebook page as well to learn more about what they do. The Canadian Mental Health Association has opportunities such as Bingo Volunteers, Crisis Cupboard Volunteers and Kids on the Block. Visit their volunteer page for more information, duties and qualifications or send them an e-mail. CNIB Eastern Ontario is recruiting volunteers in YOUR community. Join us for a CNIB Volunteer Information Teleconference Session. Sessions provide an overview of the Foundation and the volunteer opportunities available, as well as information that will assist your work as a CNIB volunteer. Please contact us to sign up for the next CNIB Volunteer Information Session being held: Tuesday, May 22nd at 5 p.m.
To sign up, please contact Caitlin Bruce, Program Lead for Peer Support and Youth Empowerment at 613-542-4975 x. 5064 or caitlin.bruce@cnib.ca. We look forward to getting to know you! Flexible Volunteer Opportunities – get involved in your community! Community Care Peterborough provides services which support seniors and adults with physical challenges in their choice to live independently in their own homes. We are presently seeking individuals with time available to assist in providing foot care, transportation, delivering meals on wheels, visiting, assisting in our local offices or to help in many other capacities. Contact Darci Maude at 705-742-7067 or email volunteer@commcareptbo.org for more information. Qualification is a Basic Foot Care Course and the commitment is 3 hours weekly or every other week on a Tuesday to Thursday morning. Our Foot Clinic does not run during July and August. Come join a fun group of volunteers and make a difference to seniors and adults with physical challenges in Peterborough City and County. Corrections Canada is looking for volunteers in the Peterborough area. Here are some of the volunteer roles that volunteers are assisting other offenders in different communities across Ontario. If you think this may interest you please contact me below either by phone at 613-634-1069 or by e-mail. Crohn’s and Colitis Canada are looking for volunteers for their Gutsy Walk. Be GUTSY and have fun volunteering. Gutsy Walk is a fun, family-friendly way to meet new people, support a great cause and raise money for research. Volunteering at Gutsy Walk gives you lots of options and flexibility. Volunteer by yourself or with friends & family; volunteer on event day or help plan the event; use existing skills or learn new ones. Areas you can help with include refreshments, registration, set-up/tear down, entertainment & activities and more. APPLY NOW or LEARN MORE. East Central Therapy Dogs are always looking for people-loving dogs and owners to visit our clients in hospital and in long term care. We hold dog evaluation tests in the spring and the fall. Successful teams attend an orientation session and are taken on their initial visit by an experienced team. Then they are assigned a location to visit each week. We need dedicated volunteers as our clients count on us to visit regularly and share the unconditional love of our dogs with them. For more information, please contact Anne Corke 705-749-9698 or Dianne Hartwick 705-652-7092. The Elizabeth Fry Society of Peterborough is seeking volunteers to help with various events to raise awareness about our organization and to raise funds for our community programs and services. Our volunteers typically assist with our Tag Day Events at local retail locations, including dates throughout Summer 2016. Additionally, we have a charitable assignment each Friday at Delta Bingo & Gaming Centre that we attend with our volunteers. These opportunities are great for students looking to build their resume or for anyone looking to get out in the community and meet new people! For more information please contact us or visit our website for more information: efryptbo.org. The Fairhaven Foundation is looking for an administrative volunteer 1 day a week. Kids arrive at school hungry for many reasons: long bus rides, skipped breakfasts on rushed mornings, and sometimes, not enough food at home. Food For Kids Peterborough and County school breakfast programs model healthy eating and invite ALL kids to enjoy good food with their friends in warm and inviting place. When kids are well-nourished they have a reduced risk for disease, have better attendance and participation in class, get higher test scores and are more likely to graduate. Over 1000 volunteers, including community members, students, parents and educators volunteer an average of 900 hours every week to make local programs happen. Last year, volunteers served over 2.4 million healthy breakfasts and snacks to over 17,500 students in Peterborough and County. Food For Kids is currently looking for volunteers to shop, prepare food, serve, clean up, coordinate and fundraise for these programs. Positions vary from school to school and include a variety of time commitments and schedules. If you are interested in volunteering for a local Student Nutrition Program, please contact your local school or visit foodforkidsptbo.ca or call 705-743-1000. Habitat for Humanity is looking for volunteers to man their booth at the Peterborough Home & Outdoors Show. Please contact Jenny Gibson for more information. Junior Achievement of Peterborough, Lakeland, Muskoka promotes the importance of financial literacy & entrepreneurship, staying in school and the value of a dollar and a hard days work to local grade 3, 5, 7 & 8 class rooms. Contact Melissa for more information on volunteering. We depend on people like you, who care about protecting important natural places in the Kawarthas. Volunteers are our lifeline —the heart and soul of who we are. Sharing your time and talents as a volunteer, while connecting with other passionate individuals on our team, makes it possible to achieve amazing things! Various exciting volunteer opportunities are always available. We match your interests with our needs to ensure the best fit. Please visit Kawarthalandtrust.org/volunteer to apply. The Kawartha Turtle Trauma Centre has quite a range of volunteering jobs available from turtle care to outreach and education. Visit their volunteer page for more information. The Kawartha Youth Orchestra is looking for volunteers for a variety of jobs. From committee positions to hands-on stage crew, we have an assortment to please any palatte! Visit us at www.thekyo.org to find out more about what we do or our volunteer page to check out volunteer jobs. Champions for Youth is a community mentoring program for youth ages 12 to 17 who have had a "brush" with the law. The Kawartha Pine Ridge District School Board initiated this program to engage students who have had difficulties and are at risk of dropping out of school, to help them to succeed academically and socially. SEEDS is a program began by inviting Education Centre employees to volunteer time equivalent to one-half day per month in supporting students and schools. SEEDS later expanded to include members of our community interested in dedicating a portion of their time and expertise to make a difference in the life of a child or youth. The Kawartha Wildlife Centre is building a team of captivating, influential and compassionate people for all types of volunteer roles! Are we looking for you? Everyone has a stake in a healthy environment. We need fish in our lakes; animals in our forests, and birds in our skies. Kawartha Wildlife Centre is a charitable wildlife rehabilitation organization located in Ennismore. Our goal is to rescue, rehabilitate and release sick, orphaned and injured native Ontario wildlife. To further this goal, we have established a rehabilitation centre for wildlife serving Peterborough and the Kawarthas to educate our community on how to care responsibly for wildlife. We are currently in the start-up phase and are looking for committed volunteers for office shifts, fundraising, community outreach, wildlife ambassadors and eventually animal care (we are not currently accepting animals). We also have the following three leadership positions we are eagerly looking to fill. Fundraising Coordinator - Reporting to the Board of Directors, the Fundraising Coordinator will develop and organize a fundraising committee. Through this committee they will strategize, plan and initiate fun, exciting and creative events within our community. This person will lead and develop volunteer teams to successfully and enthusiastically carry out fundraising events and activities. Corporate Relations Coordinator - Reporting to the Board of Directors, the Corporate Relations Coordinator will eestablish connections with local organizations and professional networks to further the message and mission of the Kawartha Wildlife Centre. This includes engaging in enthusiastic and professional face-to-face interactions with our community supporters with the goal to secure corporate donors and members for Kawartha Wildlife Centre. Health & Safety Coordinator - Reporting to the Board of Directors, the Health & Safety Coordinator will develop and maintain procedures and protocols to ensure compliance with all workplace and external regulations. Ensure that incident reports are being filed and remedial action taken. Administration and operation of compliance with MSDS, WHMIS rules and regulations. Assist in training during volunteer orientation sessions and organize spot inspections and ongoing health and safety training components for volunteers. We are looking for energetic volunteers in your area who want to give back to the community. Why not be a part of the Kids Help Phone Volunteer Team for this amazing one day event? *Positions may vary depending on Walk location. Kids Help Phone is a Canadian and world leader, known for our expertise and continuous innovation as Canada’s only 24/7 counselling and information service for young people. Our service is free and anonymous, and supports young people as they build skills and abilities to improve their emotional health and well-being. In addition to an array of counselling options, young people benefit from Kids Help Phone’s wide range of therapeutic online resources. We also work to share young people’s perspectives and improve their well-being on a societal level – locally, nationally and globally. The Walk so Kids Can Talk presented by BMO is a fun and inspirational 5K walk where thousands of kids, adults, families, schools, community organizations, and corporations across Canada join together to support kids’ emotional well-being by raising funds for Kids Help Phone. It’s a terrific way to build community and enjoy a great experience outdoors while supporting an important cause. Held on the first Sunday in May since 2002, the Walk is Canada’s largest for child and youth emotional health and well-being and kicks off Mental Health Week in Canada each year. The Walk allows Kids Help Phone to keep its services available to kids across Canada 24/7. Training: Information with meeting spot and staff lead will be provided to all volunteers in advance of event day. Staff member on-site provides additional orientation and training during the event. Just want to sing and have fun? A new singing group starting in Peterborough and Millbrook may be the place for you to try! All voices welcome! No Auditions, No Pressure and No Requirement to read music. If you've ever wanted to sing with a group just for fun this could be for you! There will be an afternoon group and an evening group. Aphasia and Communication Disabilities program is a non-profit program of March of Dimes Canada. Our group aphasia programs support people who have communication disabilities as a result of stroke, brain injury or brain illness. Volunteers provide support to adults with aphasia by leading group conversation sessions about current events, music, food, art and much more. No prior experience is needed and training is provided. This fun and rewarding volunteer experience requires a weekly commitment of 3 hours and a minimum of 6 months. We run a program in Peterborough on Thursdays. All program times are during regular office hours. For more information please contact 1-800-567-0315 ext 6266 or send an e-mail. You can also download the brochure. Ode'min Giizis looks for volunteers each year for their June festival, here in Peterborough. Are you a community minded individual with leadership, fundraising or social media skills and a strong interest in the natural environment of the Otonabee watershed? If you are, we would like to talk to you! The Otonabee Conservation Foundation Board is seeking applications from interested individuals to fill several vacancies. Volunteers commit to attending 6 - 8 meetings a year and participate in fundraising and other activities. The total time commitment is about 2 - 4 hours per month. If you would like more information or have questions about this opportunity, please see our website www.otonabee.com/foundation or contact us by email at foundation@otonabee.com or call us at 705-745-5791. Ovarian Cancer Canada is looking for leadership volunteers to help make the 2016 Ovarian Cancer Canada Walk of Hope a huge success! Under the guidance of Ovarian Cancer Canada staff, Walk committees design, implement and host their community Walk. Volunteers will gain leadership experience, network and build their resume. The Walk is a family friendly event in over 40 locations across Canada. Funds raised support women and their families, research and awareness. If this sounds like you or someone you know, or you would like some more information, please email info@ovariancancerwalkofhope.ca with the subject heading “Peterborough Walk Committee Volunteer”. PARN is looking for volunteers who can help with our annual Red Ribbon Campaign on Friday, November 25 and Saturday, November 26. On these days, PARN supporters will be stationed at locations throughout Peterborough and the 4 Counties to give out red ribbons and collect donations in recognition of AIDS Awareness Week (November 24-30) and World AIDS Day (Thursday, December 1). Volunteers work in pairs in two hour shifts, and a quick training session is provided before you head out to your location. It can get cold at the end of November, so we’ll have hot chocolate and soup delivered to you during your shift. If you are interested in volunteering, please contact Dylan DeMarsh at: 705-749-9110 or dylan@parn.ca. The Peterborough Humane Society has positions to foster or work with the pets, dishes/laundry/clean, administrative support, fundraising and pickups. You can apply online or download the form and apply in person. The Peterborough Huskies is a team for males/females ages 5-85+ who may be on the Autism Spectrum, ADHD, Down Syndrome, Tourettes, Cerebral Palsy, FASD, MS, Neurological Issues, may be Visually or Hearing Impaired, who may have a medical condition that prevents them from playing on a contact sports team, etc. We will have either a practice or a game for one hour, once a week per team. We have a junior and an intermediate team, some players will need assistance on the ice to help them learn to skate and play hockey. Everyone plays regardless of ability.Our main goal is to have fun. We are looking for volunteers to work with these amazing players and make a one year commitment to the team for our 2014-2015 season. We play hockey from October to March. We provide at least two off ice activities for the players every month, year round. We encourage volunteers to join us at the activities to give you a chance to get to know the players better. It is an experience you will never forget. We do require a police check before working with the children and adults. Please contact us for more information. Get involved with your community, meet new people and enjoy great live music! Peterborough Musicfest is looking for volunteers for the 2016 season. There are four positions to choose from: Usher, Parking, Guest Services, Fundraising. Come and help us celebrate our 30th Anniversary! For more information or to volunteer, contact 705-755-1111 or volunteer@ptbomusicfest.ca. Many volunteers are community members who are retired or who work part-time or full-time. In addition to our adult core, there is a student volunteer program for those 14-18 years of age and a program for college and university students. Volunteers contribute their time in various areas of the Health Centre seven days a week, some of which generate revenue like the Gift Shop and Lottery ticket sales. We have opportunities in both patient care and non-patient care areas, all of which support our staff and enhance the patient and family experience at Peterborough Regional Health Centre. Peterborough Reintegration Services is dedicated to improving community safety by providing a supportive environment for individuals making the transition from prison to the community. We are looking for individuals to support the offenders community integration by providing a consistent network of emotional support; assessing practical needs and developing pro-social strategies and solutions. This role requires a minimum one year commitment and training will be provided to all volunteers. Interested individuals are asked to contact Jessica. The Purple Ontion Festival celebrates local food and each year needs voulenteers. To sign up, "Like" the Transition Town Peterborough group on Facebook and offer to lend a hand. The ReFrame Peterborough International Film Festival looks for volunteers to help out with the organizing committee, volunteers for the festival weekend, and supervising volunteers. The Riverview Park and Zoo is looking for volunteers. The Salvation Army in Peterborough has numerous volunteer positions that range from breakfast programs, thrift store and food bank help, to help at Christmas. E-mail Katherine Rushton if you can lend a hand. Snofest is looking for some new volunteers to join us on our planning committee! We meet every other Wednesday from September to December planning and preparing for Snofest and then in January we participate in as many events as we can! Being part of the Snofest Winter Carnival is exciting and fun for the committee members and we are thrilled about providing events for the community of Peterborough to participate in! If you are interested in joining us or would like some more information, e-mail us. Please send a letter of introduction if you are interested in joining the committee - we would like to get to know more about you and learn more about committees/organizations you have been involved in and what your stengths and interests are. Telecare Peterborough is accepting registration for Fall Training for New Volunteers. Telecare is looking for compassionate, emotionally mature phone volunteers. Everyone who has faced a challenging time in life, knows that having someone to talk to can make all the difference in the world. It can be very lonely and difficult if there is no one who is able to listen. Telecare volunteers know the importance of listening with understanding and without judgement. Volunteers attend a 50-hour interactive training course covering topics such as active listening, crisis intervention, mental health, social issues and community resources. Fall Training begins Saturday September 17th at 9:30 am at Trinity United Church, 260 Reid St. Cost is $50. (Subsidies are available). Training offers many opportunities to reflect on life experiences. Training is enhanced by the sharing of volunteers’ own life experiences. For more information regarding volunteering, training times and locations, or to register, email: info@telecarepeterborough.org, visit www.telecarepeterborough.org find Telecare Peterborough on Facebook or telephone 705-745-2273. Transition Town Peterborough has many Volunteer openings in the local transition movement beyond those shown below. Contact Dave Sumner Volunteer Support or Fred Irwin. TTP Board Of Directors: Seeking a new member of the board interested in becoming the Treasurer/Officer replacing the incumbent who would remain on the board. Transition Skills Forum: Openings now for a Co Director and Registrar. Purple Onion Festival: Grounds Crew requires a leader and crew of 4 for set up and tear down. Information Booth & Festival Survey Team volunteers are also needed. Show Team: Transition Town enters a multitude of events and shows each year. A team of three is required to organize our signs/gear/brochures, and work shows and call for more volunteers as the need arises. Kawartha Loon Exchange seeking volunteers to help service the growing number of members of the KLE. You can volunteer at the United Way of Peterborough for anything from board, cabinet and committee positions, to volunteering for local events through their volunteer page. Retired, looking for a new experience or wanting to give back to your community? VON is always in need of volunteers to assist with a variety of our programs and activities. The Warming Room is looking for volunteers to help with the emergency overnight shelter, open from 9pm - 9am each night, year round. Volunteers assist staff in providing a safe and welcoming space to those with nowhere else to stay. Volunteers are also needed to help with laundry and organization during daytime hours. For more information and to apply go to warmingroom.ca/volunteer or contact Katelyn at 705-868-9276. The Workplace Integration Centre is looking for volunteers to join their mentoring program. Help internationally trained professionals who are interested in your same area of expertise by becoming their mentor.